Randomized controlled trials are one of the most powerful and revolutionary tools of research. This book is a convenient and accessible description of the underlying principles and practice of randomized controlled trials and their role in clinical decision-making. Structured in a jargon-free question-and-answer format, each chapter provides concise and understandable information on a different aspect of randomized controlled trials, from the basics of trial design and terminology to the interpretation of results and their use in driving evidence-based medicine. The authors end each chapter with their musings, going beyond the evidence or citations, and sometimes even beyond orthodox correctness to share their thoughts and concerns about different aspects of randomized controlled trials, and their role within the health system. Updated to include insights from the last decade, this second edition challenges over-reliance on randomized controlled trials by debating their strengths and limitations and discussing their optimal use in modern healthcare. It also includes a new and increasingly relevant chapter on the ethics of randomized trials. 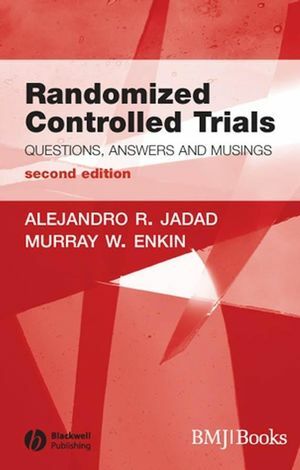 World renowned writers and thinkers Drs Jadad and Enkin bring you this invaluable book for busy health professionals who wish to understand the theory of randomized controlled trials and their influence on clinical, research or policy decisions. There is a 40-year difference in age between us and we come from vastly different backgrounds. Nevertheless, during more than a decade we have recognized the extent to which our paths and thinking have converged. We first noticed this in Oxford with our mutual interest in systematic reviews and confirmed it at McMaster University as we became painfully aware of the pitfalls of over reliance on quantitative evidence and its limited influence on health care. During the past 5 years, our focus has been more on the value of rhetoric, information and communication technologies, complex systems and the importance of effective communication in the health system. Over the years, we have grown together in our understanding, have worked together on a variety of projects, and mutually reinforced our views on clinical evidence. We are happy to share our expanding vision of randomized trials in this new edition of the book. Alex Jadad’s work helps improve health and wellness for all, through innovative uses of information and communication technologies. He is a physician, researcher, educator and public advocate. He obtained a doctoral degree from Oxford University for work on meta-analysis of clinical trials, and was the founding Director of the McMaster Evidence-based Practice Centre. He developed “The Jadad Scale” (the most widely used tool to assess clinical trial quality in the world); the Centre for Global eHealth Innovation; and a virtual platform for global collaboration, and to enable the public to shape the health system and society, worldwide. Murray Enkin is Professor Emeritus, Departments of Clinical Epidemiology and Biostatistics, Obstetrics and Gynecology, in the Faculty of Health Sciences, McMaster University. He has been a rural family doctor, obstetrician/gynecologist, and health care researcher, and is a co-author of three books, including Effective Care in Pregnancy and Childbirth, regarded as one of the most influential books in medicine and one of the foundational pillars of evidence-based decision-making. Dr. Enkin is concerned about the risks associated with over reliance on quantitative evidence and its influence on health care, a view shared by Dr. Jadad. Foreword by Dr. Sholom Glouberman. Acknowledgments from the first edition. 1. Randomized controlled trials: the basics. 2. Types of randomized controlled trials. 3. Bias in randomized controlled trials. 4. Assessing the quality of randomized controlled trials: why, what, how, and by whom?. 5. Reporting and interpreting individual trials: the essentials. 6. From individual trials to groups of trials: reviews, meta-analyses, and guidelines. 7. From trials to decisions: the basis of evidence-based health care. 8. Ethics and clinical trials: are they compatible?.